Using voice mail etiquette will speak volumes about the type of person you are even when people are not talking to you. Manners and etiquette are things that should be demonstrated in all aspects your life. It is who you are and what you are trying to portray yourself as. 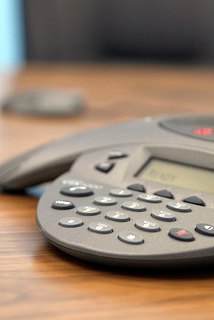 Why is having a good voicemail etiquette important? Because it is a reflection of you since you were the one that recorded the voice mail message. We have all heard those terrible voice mail recordings that we laughed at, shook our head at, or were offended at the message. See, regardless of the outcome, your message can impact people. The real trick is to impact them in a positive way. This page will focus on both aspects of leaving messages. The greeting should be concise and to the point - No one wants to listen to long extended greeting just to leave you a message. Your greeting should be to the point and brief. This will invite someone to leave you a message instead of getting frustrated with you and hanging up. State the necessary information - Good voice mail etiquette would mean that you only record the pertinent information that people need. You wold leave your name, your department, and that you are either on the phone or away from your desk. If you are recording a greeting for home use, you can choose to follow the same format, or it is also acceptable to use the system default message on your voicemail service. Most default messages state the number that the person has reached. This allows you a little more privacy if you choose. Manage expectations - You can tell the caller a lot of what to expect when they leave a message. You can tell them if you are in or out of the office, when they can expect a call back, or other information that will help them know what to expect. Don't assume that the person receiving the message recognizes your voice - If you going to leave a message, make sure that the receiver of the message knows who is leaving the message. It is also a good idea to leave your phone number even if you think they have it already. This shows good phone manners. Let them know the best time to reach you - Nobody likes to play phone tag. The best way to avoid phone tag is to leave the best time that you can be reached. Say why you are calling - Let the person know why you are calling. Make sure that you speak slowly, and clearly so that the person returning the message can understand you. Do not leave account information or other personal information on a voicemail. You never know where that information could end up or if you are leaving that information with the wrong phone number. These voice mail etiquette tips will help you convey yourself in the right way so that people are not turned off by you.